Joel Green, the young boy whose battle with terminal cancer inspired Josh Larson's intensely personal game, That Dragon, Cancer, has succumbed to his illness. He was five years old. In a blog post late last night, Green's mother Amy wrote that he had been taken to Children's Hospital in San Francisco after his health had been declining more rapidly than usual. At the time he was admitted, the nurse estimated he had a week left. 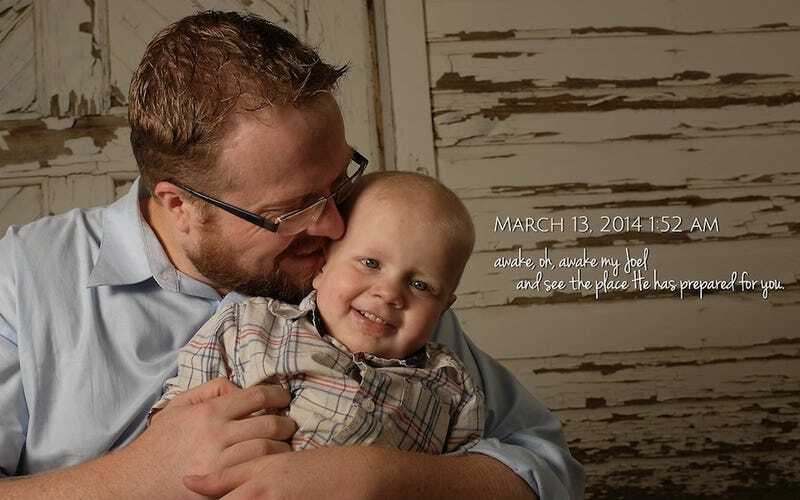 The image above, of Joel and his father Ryan, who has been working with Larson on the game, was shared on the That Dragon, Cancer website. Its accompanying text reads: "Awake, oh, awake my Joel / and see the place He has prepared for you." This is admittedly a pretty audacious effort, to invent an entire game narrative about this one event that – how can I say this in a gracious way – hasn't transpired yet. Yet. This is an ugly truth, but look. This is probably coming. I'm sorry. This is a game about something that is only inevitably coming. But it's coming for all of us. And that is the loveliest thing about That Dragon, Cancer: we will all meet this thing, or have already met it. Maybe that should be scary, but That Dragon, Cancer is about sustaining the hope and joy of life for just as long as we can. I like poetry. That Dragon, Cancer is entirely made up of poetry. An old poetry professor of mine is waiting to die of some rare blood cancer. The wonderful thing about his certain-death cancer is, he could die tomorrow, or he could die at ninety. "Certain death" is incredibly silly that way. What was it e.e. cummings said? It was some line of poetry. How did it go? It went something like, "for life's not a paragraph. And death I think is no parenthesis." I have no idea what it means; I just like it. We offer our condolences to Joel's family.